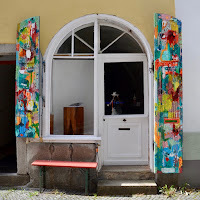 Passau is our last stop in Germany. It sits on the border with Austria at the confluence of three rivers, the Ilz, the Danube and the Inn. The boat moors on the Danube where the three rivers meet, right opposite the entry of the Ilz, the smallest of the three. Roman, our guide, walks us around the headland of the Danube bank and along the bank of the Inn. He points to the distinct colour of each river’s water: the Ilz is dark blue, the Danube a murky green and the Inn almost white; the three waters flowing side-by-side, as they gradually coil into each other. We meander our way up to St Stephen’s Cathedral dominating the town above the river valleys. 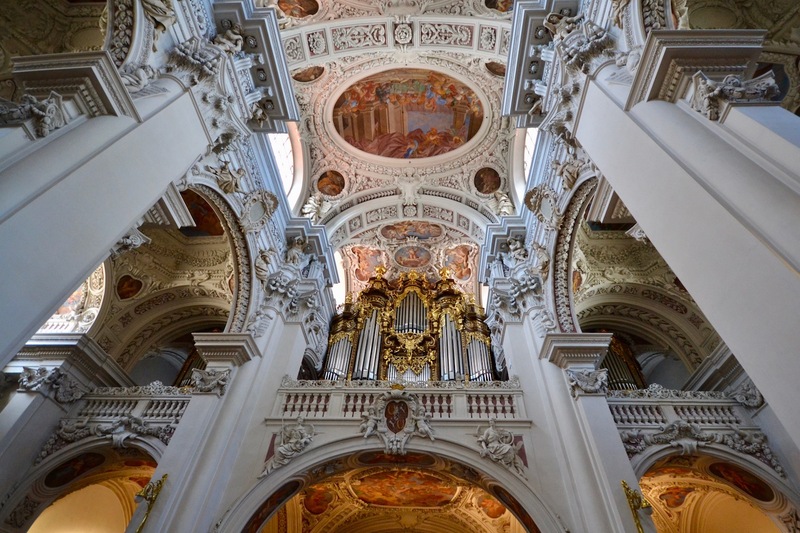 Passau suffered a number of fires in the 17th Century, culminating in the 1662 fire that destroyed much of the city, after which the rebuilding was in the Italian baroque style, hence the Venice nickname. The Cathedral, a masterpiece, is a worthy example and we arrive mid-morning. A service is underway and signs demand no sound, no photos, and no walking around. So, we waited… and watched. The four priests are dressed in garments of white and gold, matching the colours of the Cathedral. Sadly, they almost outnumbered the congregation. The service is over quickly and the signs are swept aside. The church is famous; it has the largest cathedral organ in the world and regularly hosts concerts – even more sadly, I didn’t get to hear it. We walk out into the midday sun and through the marketplace that sits in the square facing it. 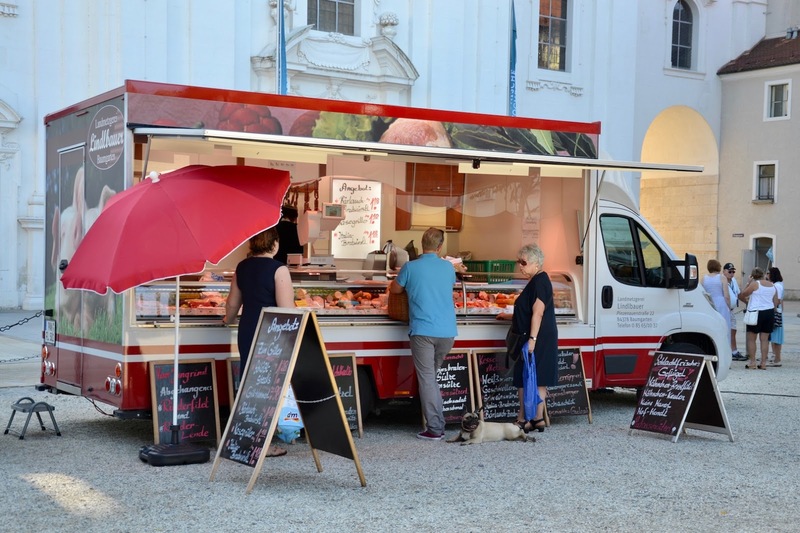 We buy some Christmas trinkets and are tempted by the ‘food trucks’ selling pastries and cold meats so delicious they could only have been made in Germany. 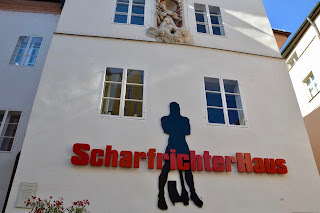 A building that pre-dates the fire is the house of the Scharfrichter (literally Sharp Judge) or Executioner. He was responsible for carrying out sentences of death conveyed by the state, using his blade, and disposing of the remains. His accomplice, the Lion (Löwe), would drag the hapless felons to their appointment, roaring as he went. In the 1970’s the building gained new notoriety as a venue for Jazz and political cabaret; local conservative authorities were not amused and shut it down. A decade later, it rose from the ashes even stronger and began awarding the Executioner’s Hatchet for political comedy. Roman says: “The most popular comedians are Austrian – they’re keen observers and sendup German behaviour so well.” Sounds to me like Canadian comedians in the US. Talking of blades, Passau was a famous manufacturer of swords in the Middle Ages, marking them with a wolf. Warriors came to believe that the wolf protected them in battle and made the Passau sword a revered possession. Logos like the wolf became known as ‘Passau art’. 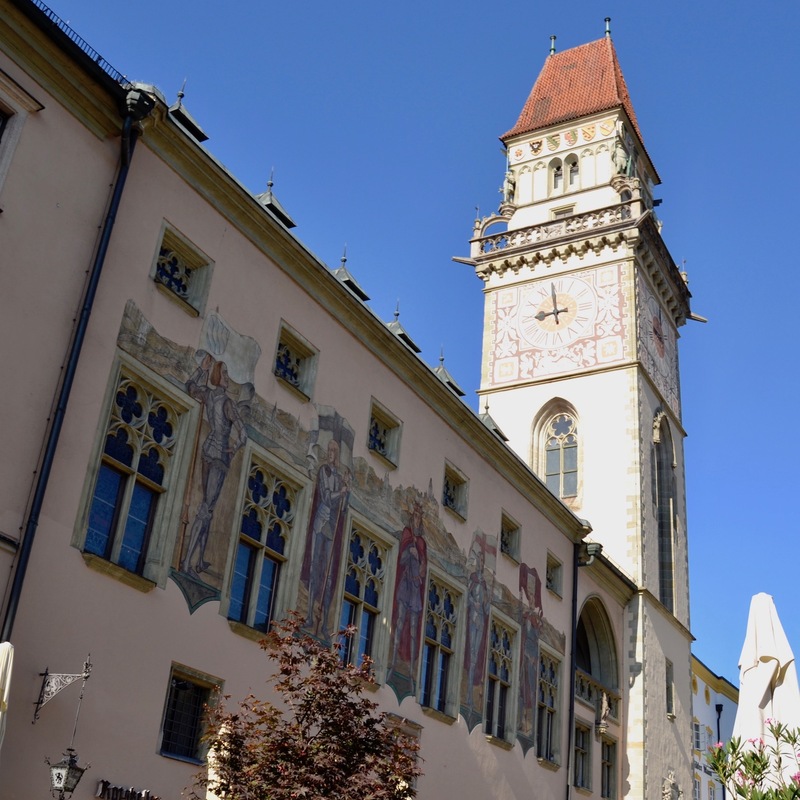 Eventually, we come back to the Rathaus (old town hall); the 14th Century building that sits on a square beside the Danube. 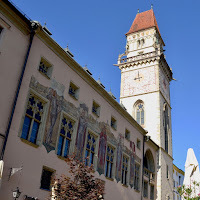 Famous for its much newer clock tower, it now sports beautiful modern paintings along its outer wall. On the side of this clock tower we see another reason to call this city Venice. Apparently, flooding to the base of the Rathaus occurs every few years but, in June 2013, the three rivers submerged the lower city. 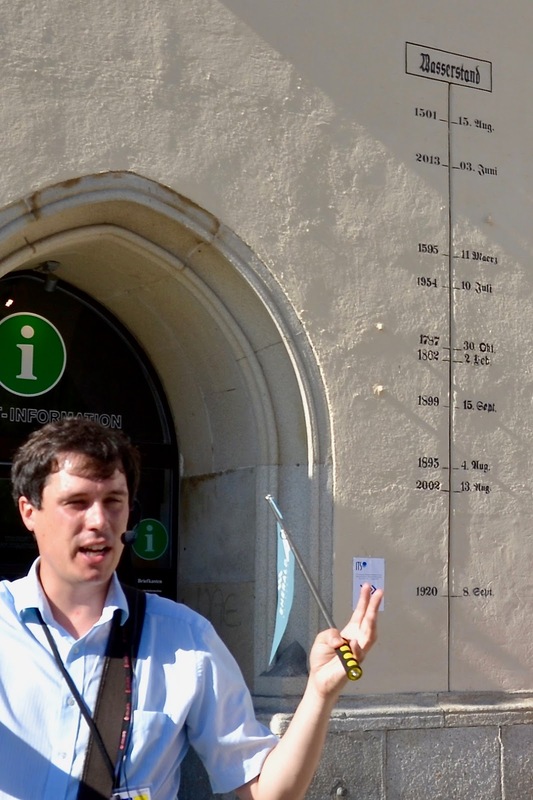 A scale painted on the wall marks the height of the flood, the highest in 500 years. 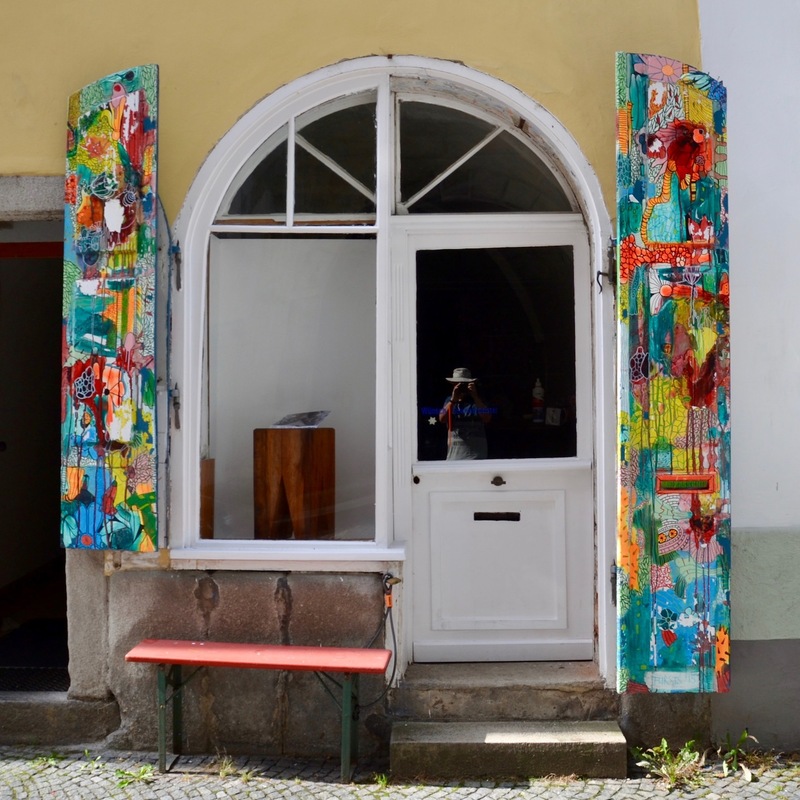 It’s a University town too, with students making up almost a quarter of the population and recently, another flood has inundated Passau, as migrants from the east travel across Austria to enter Germany here. But, on this warm, dry, summer’s day all we can see and feel is the energy, and friendliness, of youth. I found the comment about the flooding interesting as that was the same month and year that we had the flood in Calgary. Beautiful photos, especially the last one. Thanks Vicki, I’d forgotten that but you are right. I was languishing in the Middle East of course (http://expatbobinuae.blogspot.ca ) so I missed it. Thanks Bob, another great blog that wets the appetite for retirement travel. It can’t be beat Nigel. I was in Prague for that 2013 flood. Quite the experience. Then I returned a few weeks later for the Calgary flood. The Czechs were far more prepared for flooding, having experienced a major one in 2002. The army was there immediately putting up impressive flood walls. Thanks for the post. 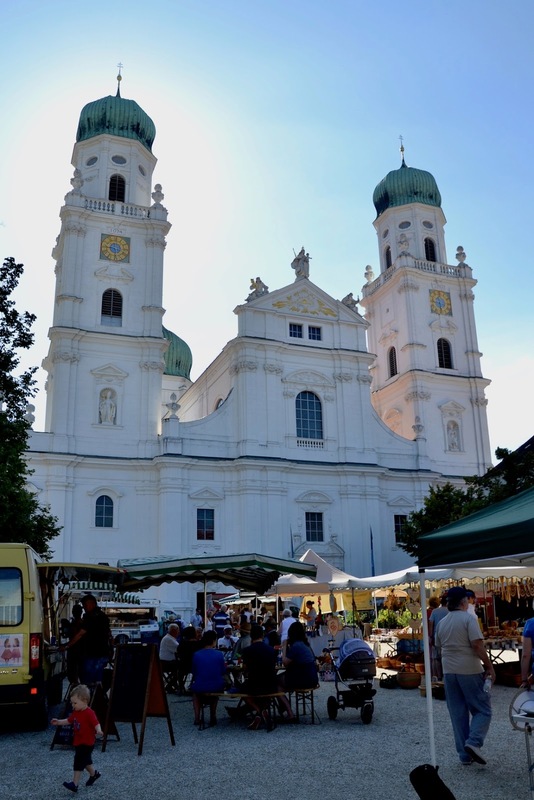 I enjoyed visiting Melk too, on a day boat ride from Vienna. We waved at the passing cruise ships.